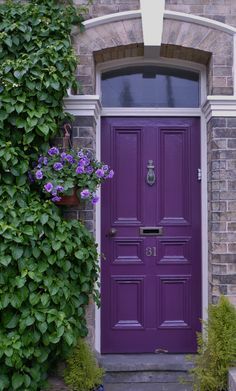 Classic red, white, and black front doors will always have their place in traditional home decorating, but they aren't your only options anymore: Colors from sophisticated navy blue to pretty purple and cheery yellow to rustic orange -- along with every other shade in the rainbow -- are finding themselves the stars of today's modern entryways. Follow these three tips to choose the shade that helps your home make a stunning first impression. 1. Consider your home's look. Whether you're living in a cottage or a colonial, a vintage Victorian or a modern mansion, your home's current style will help determine the right color for your front door. Take into account the color of your siding or brick, shutters, and current trim, and look for a door color that complements them while still catching the eye. Better Homes and Gardens suggests referencing the color wheel to find an unexpected shade that coordinates with what you already have; their designer color palettes can help, too. 2. Look at your landscaping. You can change landscaping, of course, but large-scale do-overs require more than a little time an expense -- which is why drawing inspiration from the trees, bushes, and flowers on your property is an ideal first step. Love how those lilacs look against your gray siding, or how the blue hyacinths pop against your brick porch? Use those shades as a starting point for testing a front door color you might not have thought of otherwise. Just can't picture your front door in anything other than basic white? Try taking a photo of your house and uploading it to a design site where you can drag and drop in other colors to see what you'll end up with (or find a friend who's good with Photoshop to help). Look for colorful front doors on homes in your neighborhood, and don't feel like you have to commit to your first choice: Buy samples of a few different colors to try on your door so you can see them in different lights. Even a color that might seem too nontraditional will come in shades that are more subdued, so you can come home to your favorite every day.